It was a busy and enjoyable two weeks at Fish Point from September 1st – 15th despite seven days of southerly winds at the start of the summary period. New arrivals were noted throughout the first week and there was even a small fallout on the 3rd when 57 species were recorded and 61 birds of fifteen species were banded (1.35 birds/net-hour). The wind shifted to the north on September 9 th and activity picked up in the second week of coverage, with lots of thrushes and warblers recorded and a good variety of other species observed and banded. 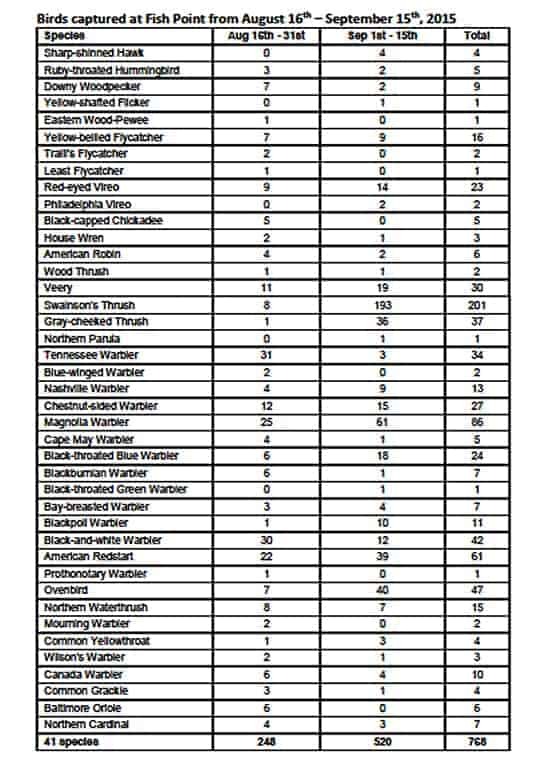 As usual for September, Catharus thrushes were the mainstay, with 229 individuals banded over fifteen days (19 Veerys, 177 Swainson’s, and 33 Gray-cheeked), or 45% of all the birds captured from the 1st – 15th. Warblers were observed and banded in good numbers as well – 22 species were tallied and 196 individuals of seventeen species were banded. It was hot and humid on September 1st (23°C at dawn) but migrants were fairly active, with 55 species documented including fall ‘firsts’ for Greater Yellowlegs, Scarlet Tanager, and Rosebreasted Grosbeak. The 2nd remained active when 53 species were recorded and 31 birds of thirteen species were captured, including 6 Ovenbirds. West winds and more warm temperatures on the 3rd didn’t discourage the birds – in all, 57 species were noted including Yellow-bellied Flycatcher, Warbling Vireo, gnatcatchers, robins, catbirds, and fourteen warbler species. Activity tapered off the next morning and almost ground to a halt on September 5th when rain and thunderstorms made for a quiet morning and reduced field coverage. After a fairly active morning on the 6th migrants started to dwindle again and it was quiet on the 7 th and 8th. A couple of fall ‘firsts’ livened things up however, with the season’s first Peregrine Falcon observed cruising up and down the west beach, along with a group of eight American White Pelicans at the tip. After twelve years without a sighting, PIBO has recorded up to twenty birds on three or four occasions in the last twelve months. Pelee Islanders have reported up to forty birds around Middle Island when boating in the area this summer, which suggests the same group has been here since at least July. A steady week of southerlies finally abated and the wind shifted north on the 9th, resulting in a good push of migrants over the next four days. New arrivals from the 10th – 13th included Merlin, Philadelphia Vireo, Northern Parula, Yellow-rumped Warbler, and Lincoln’s Sparrow, among others. 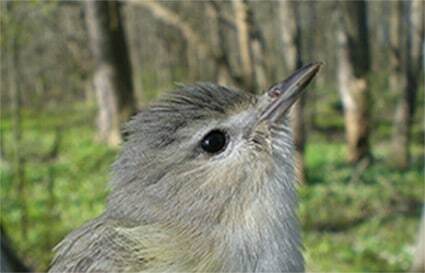 In all, 241 birds were banded over four days, with Swainson’s and Gray-cheeked Thrushes leading the way (97 Swainson’s and 23 Gray-cheeks banded), along with good numbers of Magnolia Warblers (28), American Redstarts (18), and a variety of other songbirds. As always, the pace started to slacken again after this latest pulse, and there wasn’t much to report during the last two days of the summary period save a female Hooded Warbler observed on census on the 14th . The 15th was impressively quiet – a mere six songbird species were recorded on the 90-minute census. The netting area was slightly more active, with 23 birds of six species captured, and there were some birds on the lake, but, overall, the woods were very still. All told, 17 fall ‘firsts’ were noted during the summary period, which brings the species count this fall during PIBO’s coverage period this fall to 124. A total of 505 birds of thirty-three species was banded from September 1st – 15th, which brings the season banding total to 768 birds of forty-one species captured in 1002 net-hours (0.77 birds/net-hour). Of this total, 402 of the banded birds are warblers (52%), and 276 are thrushes (36%).